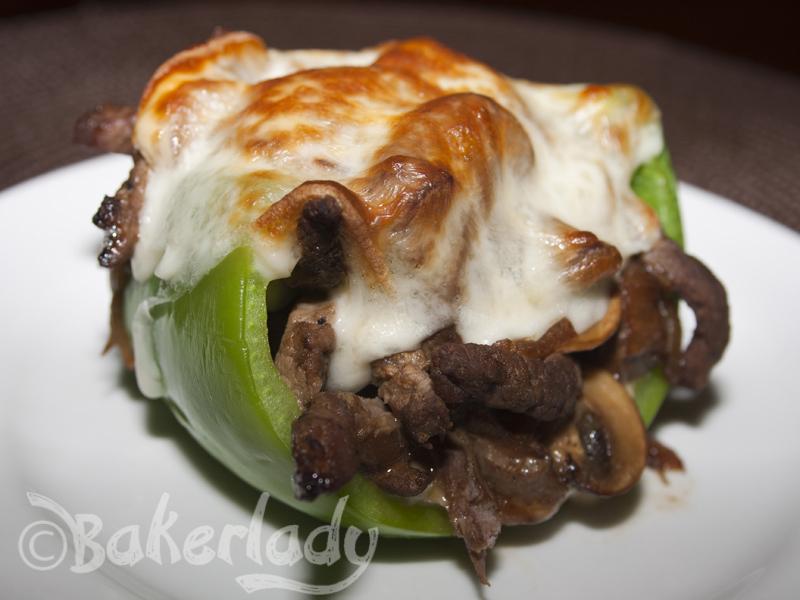 Perfectly succulent strips of steak swimming together with sweet caramelized onions and rich sautéed mushrooms all stuffed into a gorgeous pepper sandwiched between two gloriously melted pieces of provolone. (food happiness sigh) Look at me from the side. Does this delightfully dripping cheese make me look fat? 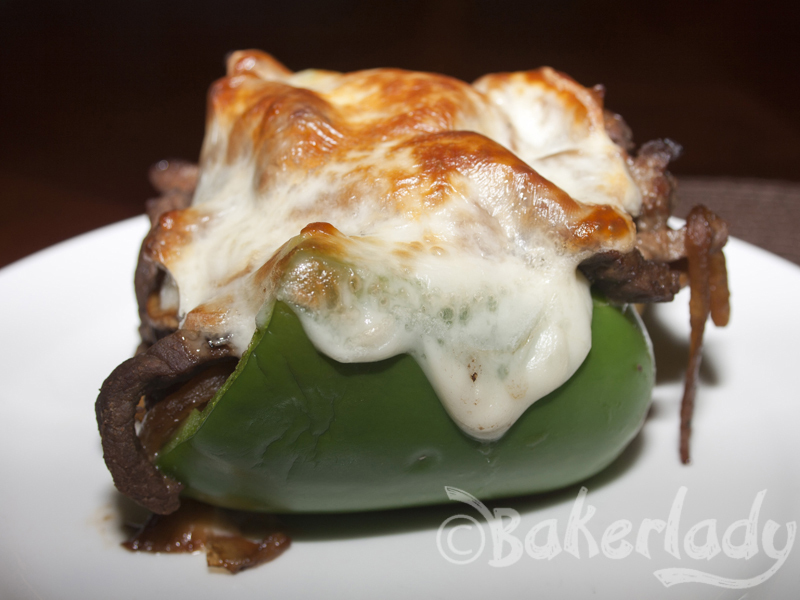 You could not stuff more deliciousness into these peppers if you tried. Trust me. I piled them as high as I could with all that amazing flavor. And they are easy. Oh so easy. You can even make them with deli roast beef like the original (wildly successful) pin says to. I didn’t chop my peppers in half – only sliced a thin piece of each to leave more room in each one for meat and cheese. Because, if there’s anything I’ve learned from Pinterest, it’s that more (of everything and anything) is ALWAYS better. Enjoy! 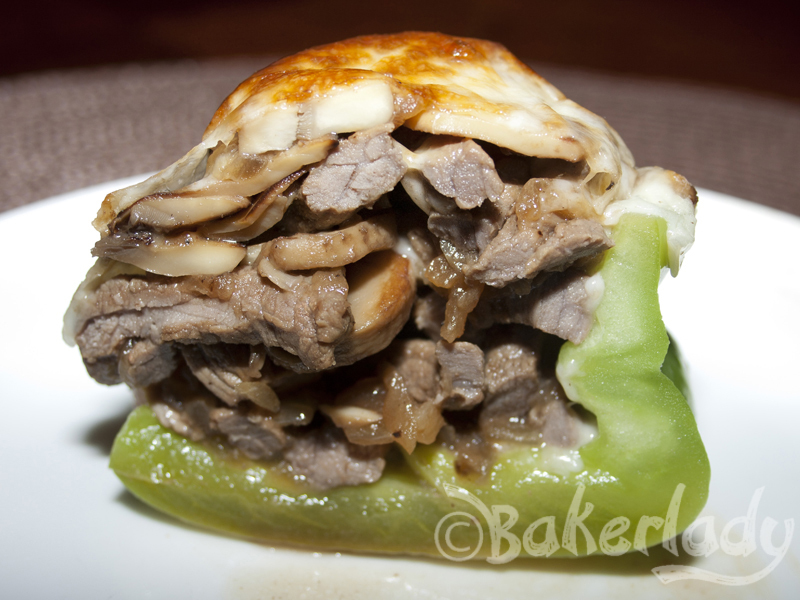 Wow this looks amazing, I have had stuffed peppers before but nothing like this. I will definitely have to try this. It also looks like it would go great with a beer. If you are looking for great recommendations on great beer follow my blog for the best. Omg I’ve seen these everywhere on pinterest too! Yours look amazing! Tonya, wonderful idea. Think of the calories you’ll save by not eating bread! You left off the Bacon. Thanks for a savvy twist on a local Philly favorite! Delish. Would you by chance have the nutrishtional facts on this dish? This recipe was wonderful. My family and friends loved it. Actually made 5 stuffed peppers from this recipe. This will be regular and it looks like you worked harder than you did. OMG!!! I MADE THESE FOR ME AND MY HUSBAND OVER THE WEEKEND AND THEY ARE SOOOOO GOOD!!! LOVE THEM!! IT WAS AN AWESOME CHANGE TO THE SAME OLE SAME OLE..
We are watching our carbs so thought to try these. 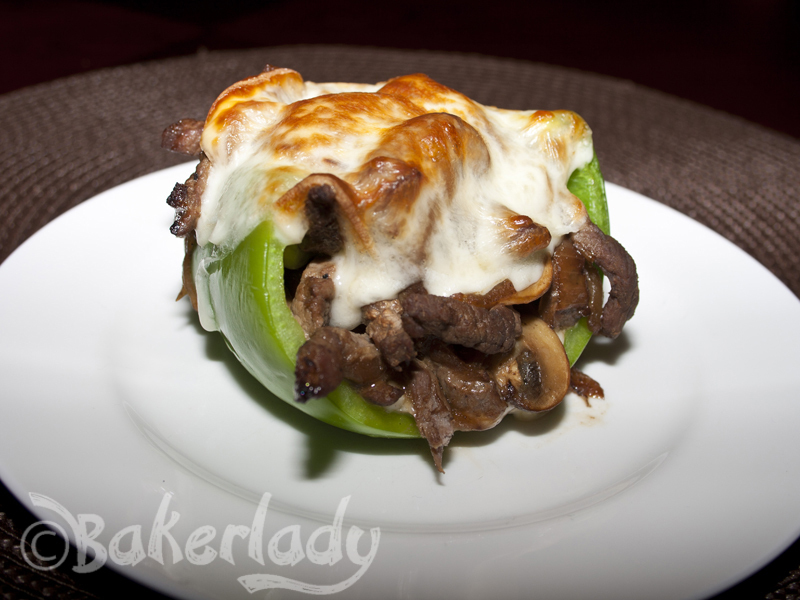 I used left over italian beef in them and they were delicious and very easy to make. We are having them again when company comes over. Looks absolutely delightful! I can hardly wait to shop for groceries to get the stuff to fix this. These look amazing! How do you think they would freeze if I wanted to make them ahead, and just thaw them to bake later? Thanks! I’ve never frozen peppers before, so I’m really not sure. I’d be interested to hear how that turns out if you try it!